Made in Suisse: Handmade Monday, here I am again! The sewing machine has finally been unpacked along with the entire moving box dedicated to my crafty goodies (crazy how much I have hoarded over the last couple of years of crafting…!). We have plans to turn one of the spare rooms upstairs into an office/craft room where I’ll be able to leave my sewing project and in-progress projects out on a table at all times. However, we need to entirely furnish this room (along with others in the flat) so it is empty for now and will remain so for another few weeks at least. This did not stop me from getting the sewing machine out on Saturday onto the living room table and getting on with a project that had been at the back of my mind for about 3 months now. I had fallen in love with this fabric at a French market in Morzine in August when we went on holidays. The colours and patterns had reminded me of the interior of an alpine chalet…not that I am trying to recreate that feel within our new flat… (although we are desperate to find some sheep skins this winter for our flat!). The idea when I bought the fabric was to use it to make cushion covers for the sofa to replace the ones made of flashy African material which weren’t really to Mr T’s taste. Three months later, and it is finally done! 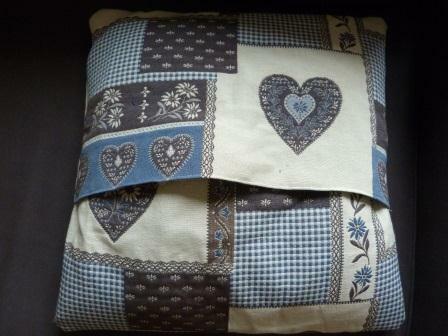 I used a simple design with two overlapping panels at the back to secure the cushion in place without having to add buttons to shut the cover. 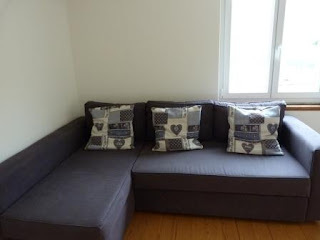 Once I got going, there was no stopping me until I ran out of material and I managed to get large three cushion covers out of the fabric I had bought. I don’t have much left over fabric but I’ll try to put them to good use, making lavender sachets or other small projects with them. The room and the sofa still look barren but the cushions are one step in the right direction! For my fix of creativity, I am off to Wendy’s blog for Handmade Monday! How exciting/scary to have a blank canvas to work with. 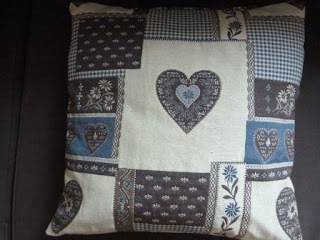 The fabric is really pretty and chimes in so well with your sofas. Am rather jealous that you will have your own workroom! What lovely material. Good luck with the re-furnishing - exhausting but great fun too. Goregous fabric and tones in beautifully with your sofa. So nice to be able to say "I made those" when folks come around. Oh - they are stunning. I always love a room that's taking shape - before it gets filled up with all the bits & bobs associated with everyday life! (Well, in our house anyway). That fabric is beautiful and they look so professional - well done! 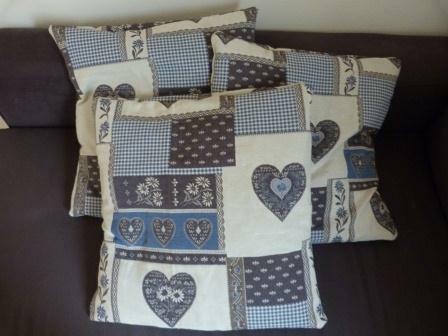 The cushions look great, it's beautiful fabric and I love making covers this way. They look lovely on your sofa. lovely subtle colours - nothing like making something for a new home is there? 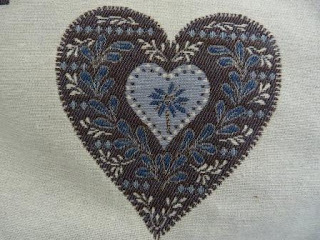 You can see the amount of love and toil that's gone into making the cushions. They look lovely, such a perfect match for the sofa. Gorgeous fabric colour and design and to top it all there is a heart design on it. How classy are those? I love the material and it makes up some stunning cushion covers. A lovely make! Thanks for sharing! That fabric is beautiful and it makes really perfect cushions - nice job!